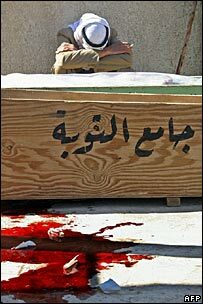 At least 36 people have been killed across Iraq as the authorities struggle to contain sectarian violence in which at least 165 have died this week. The bodies of 14 Iraqi commandos were recovered in south Baghdad following a gun battle with Shia militiamen. A car bomb in the shrine city of Karbala killed eight, as others died in attacks on a Shia family and a funeral. A curfew has been extended in Baghdad to try to quell the violence, sparked by Wednesday's Samarra shrine bombing. Senior Iraqi political leaders - including the president and prime minister - also met for talks late on Saturday. This week's violence - which has led to fears that Iraq may descend into civil war - was sparked by the bombing of one of the country's holiest Shia sites, the al-Askari shrine in the city of Samarra. Prime Minister Ibrahim Jaafari has vowed the government will rebuild the Shia shrine and Sunni holy sites attacked in revenge for the al-Askari bombing. The Iraqi government has now extended until Monday morning a ban on cars in Baghdad. The authorities had earlier renewed a curfew covering Baghdad and the provinces of Diyala, Babil and Salahuddine from Friday evening to 1600 (1300 GMT) on Saturday. Prime Minister Jaafari announced a ban on demonstrations and a clampdown on the carrying of weapons in public. Defence Minister Saadoun al-Dulaimi called for Iraqis to unite against extremists, saying no one would benefit from civil war. "We are ready to fill the streets with armoured vehicles," he told a news conference in Baghdad on Saturday. Despite measures taken by the authorities, violence broke out on Saturday at the funeral of Atwar Bahjat, a prominent Iraqi journalist. The funeral procession came under fire as it was approaching the cemetery, and then was bombed as it returned after the burial. At least two people are reported to have died in the blast, and five more were injured, some seriously. 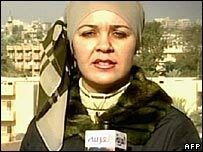 Ms Bahjat and two crew members from al-Arabiya TV were killed in the wake of the attack on the al-Askari shrine. In Karbala, a predominantly Shia market city which is not under curfew, at least eight were killed and 30 injured in a car bombing. US President George W Bush has urged restraint, saying: "This is a moment of choosing for the Iraqi people." The BBC's Jon Brain in Baghdad says the centre of Baghdad has been calm, with the streets virtually empty for a second day and no newspapers published. Shia and Sunni Muslim leaders in Iraq and abroad used Friday prayers to issue appeals for restraint and unity.